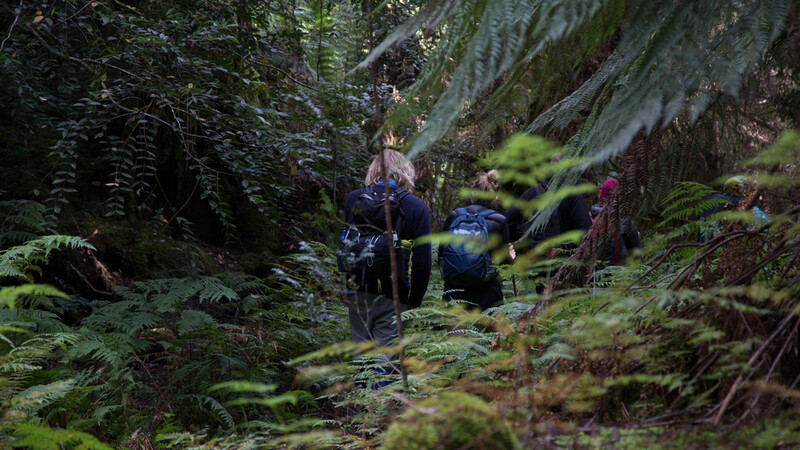 The company of our incredible guides, all of whom hold their own depth of knowledge, passion and love for Southwest Tasmania. 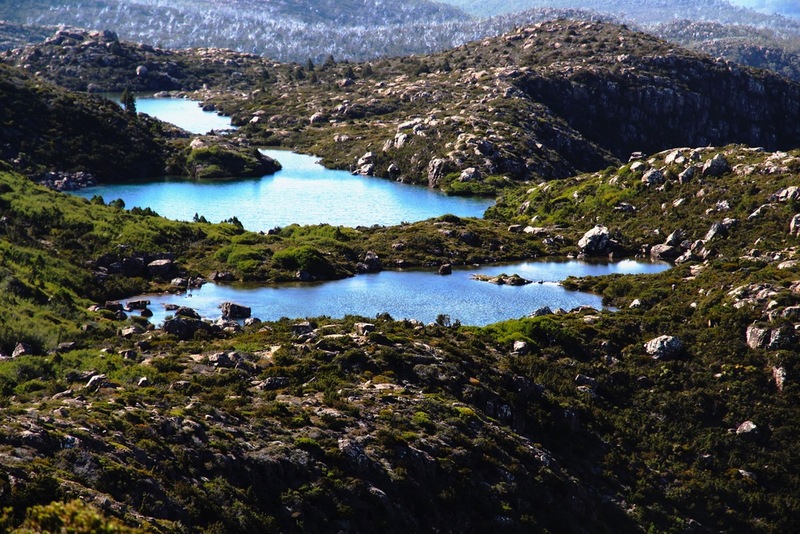 Our hike begins deep in the gnarled Eucalyptus valleys skirting Lake Webster and Twisted Tarn where we wander through landscapes littered with evidence of the glacial activity that dominated this landscape tens of thousands of years earlier. 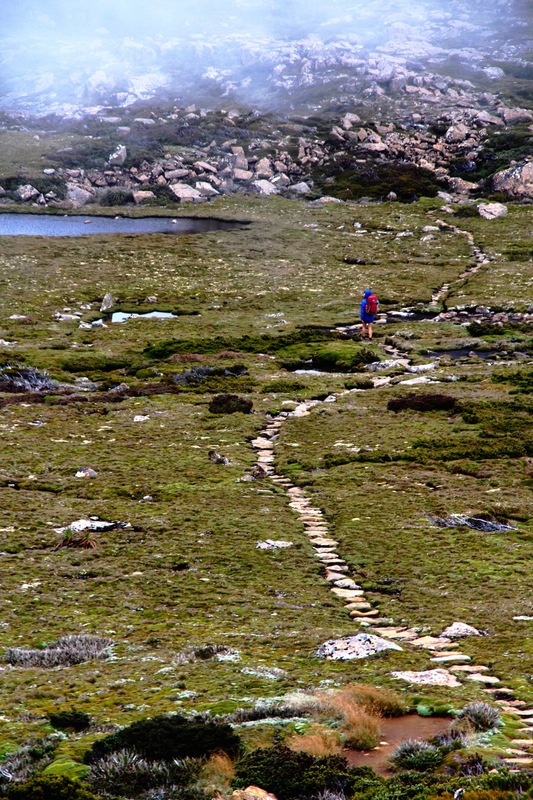 We clamber our way through battered rocks torn into thousands of boulder fragments, a swathe of lakes and tarns brimming with the purest of waters, and a landscape of unfathomable beauty. We encounter layers of history as we gain height towards panoramic views, exploring historic huts and backcountry ski refuges. 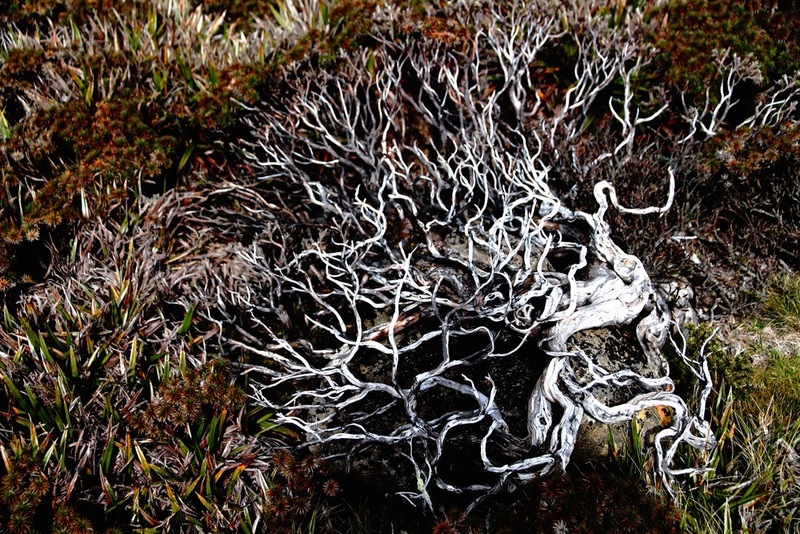 We meander onto the famous Tarn Shelf and witness the ancient deciduous Myrtle Beech 'Fagus' (Nothofagus gunnii) which skirts the shores of the glacially carved tarns and mountain lakes. If you're lucky enough to be walking with us in April you might have the opportunity to witness the Fagus 'turn', its beautiful warm red to yellow honey tones contrast starkly as one of Australia's only native deciduous plants. After our walk, we hop in our bus and as we head west the landscape begins to change; leaving behind the rolling hills in exchange for the raw and stark beauty of the Tasmanian Wilderness World Heritage Area. 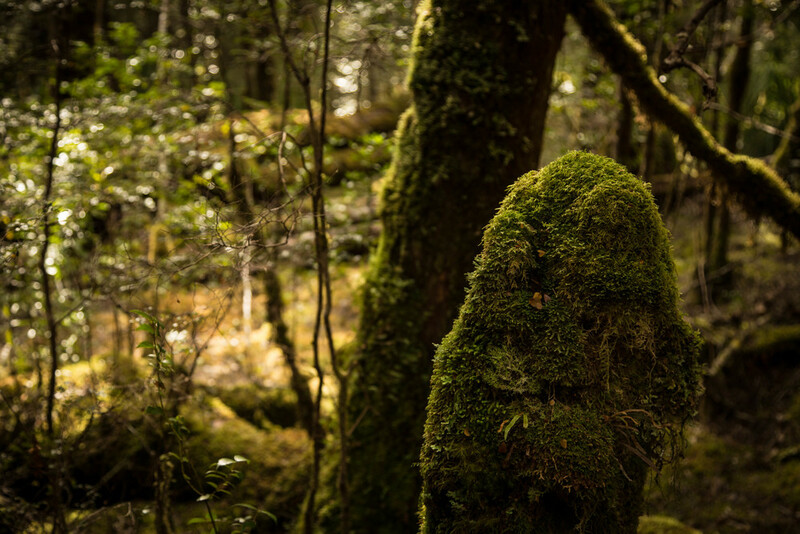 Every town travelled through is both smaller and more peculiar than the last, until we find ourselves in the Southwest National Park - the largest national park in Tasmania at over 600 000 hectares of mesmerising wilderness - our playground for the remainder of the adventure. Our home for the next three nights sits beneath billion-year-old quartzite peaks at the heart of Tasmania's Wilderness. Overlooking what appears to be a dragon's backbone, the lodge appears seemingly timid beneath the Frankland Range. 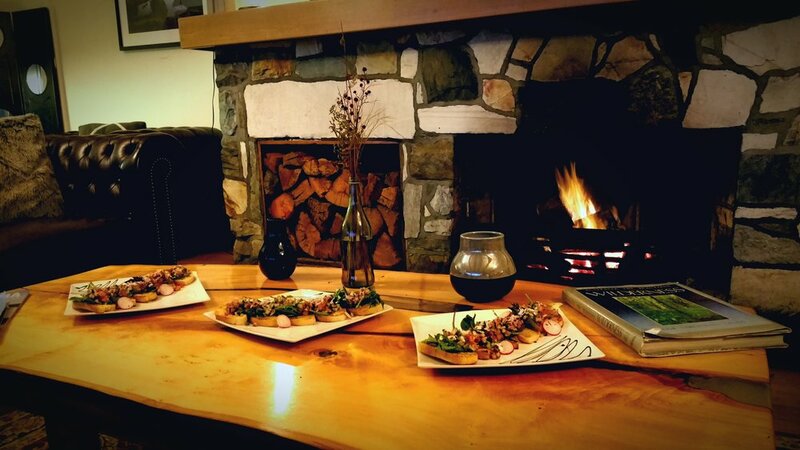 Over a glass of Tasmanian wine and seated in front of a roaring fire we can relax and enjoy a three-course meal of Tasmania's finest produce as we watch the weather roll across the landscape at the whim of the Roaring 40s. 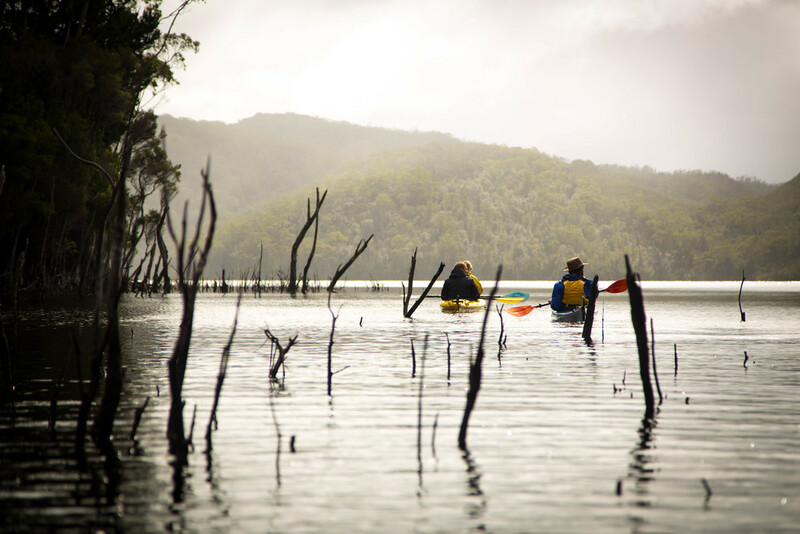 We depart our temporary home at the Pedder Wilderness Lodge and drive for only 10 minutes to find ourselves in the Sprent basin where the Serpentine river once drained Lake Pedder downwards into the Gordon River and onwards into Macquarie Harbour and the Southern Ocean. In our two-person kayaks, we begin cutting through the mirror-like waters, through Bells basin, and out into Serpentine reach. 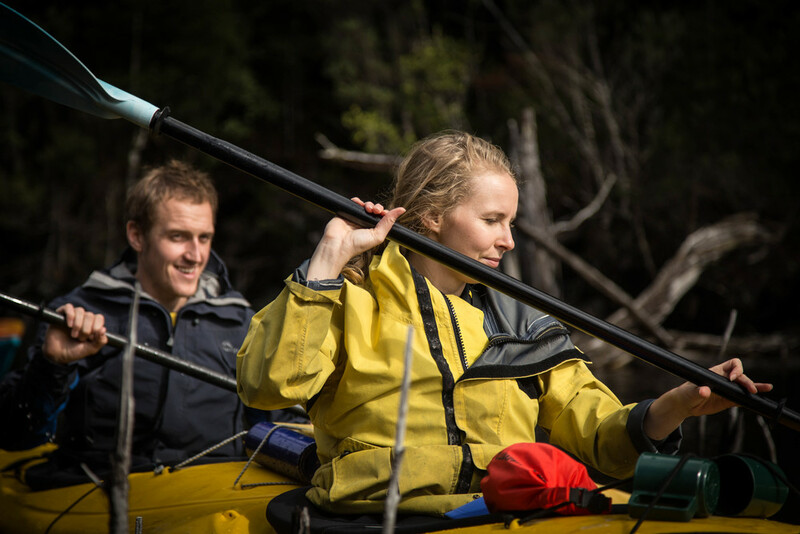 Being within the boats and having the waters that sit atop the old Lake Pedder at our fingertips we find ourselves truly connected. Open expanse gives way to enclosed and protected waters as we meander our way through an ancient quartzite gorge. The craggy peaks above shed flowing waterways, giving our legs an opportunity to rest in the kayaks as our upper bodies now bare the load. As we open out to the expanses of the lake, we encounter cove after cove of pink quartzite beach, twisting past the protruding Wilmot Island. 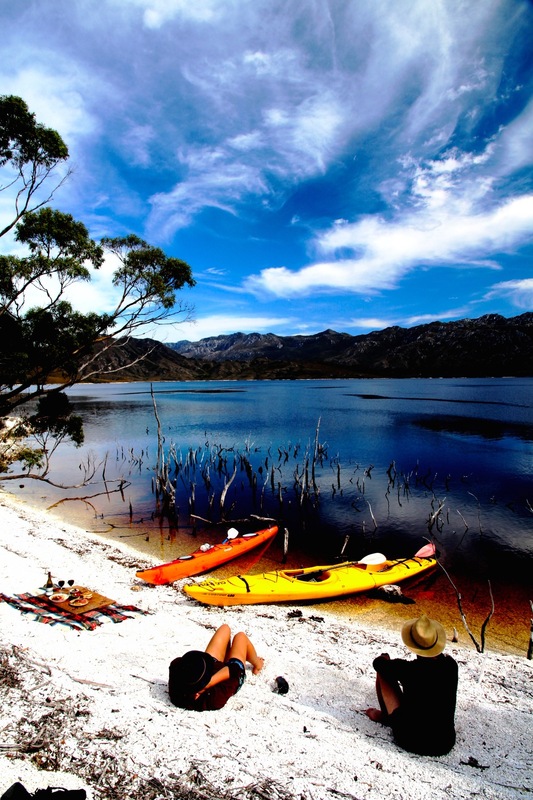 Beaching our vessels we arrive to a picnic lunch perched under the powerfully inspiring Wilmot and Frankland Ranges. 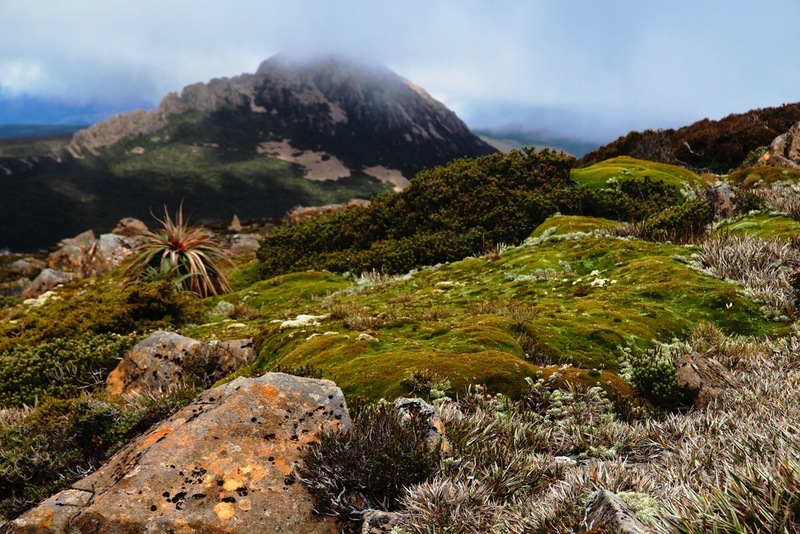 If you fancy a walk to the highest point views reward you with a vista encompassing peaks from the Sentinel Range, Mt Wedge, the Frankland Range and Mt Anne. After lunch we retrace our path past the Bells basin inlet, cutting a wake past White Spur Point and Trappes Island. The Pedder Wilderness Lodge provides a welcome sight on the horizon as we cruise our way into Strathgordon Bay. Disembarking at the boat ramp we can retire to our accommodation for the night with full knowledge we have earned a hearty meal. We begin our walk at Condominium Creek and quickly begin our challenging ascent through buttongrass and ragged quartzite spurs. 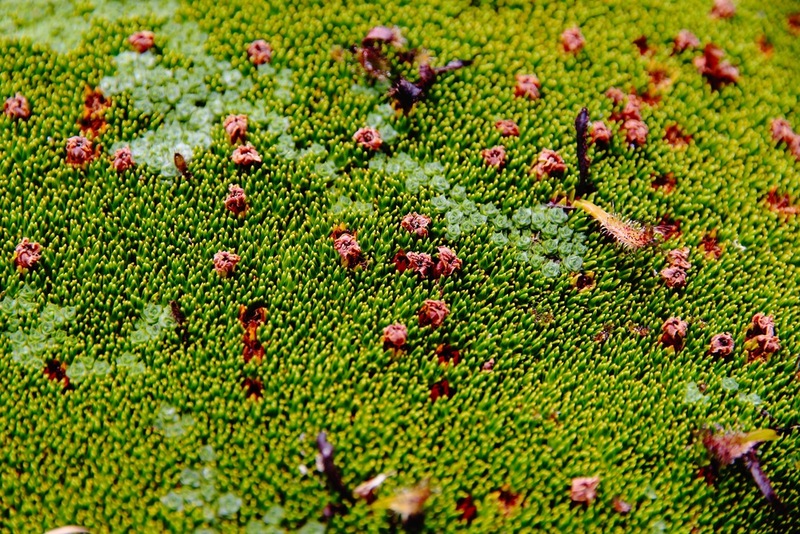 Wildflowers strewn across a carpet of gold give way to alpine stunted Varnished Gums - Tasmania's smallest Eucalyptus. Dare to turn around and you will find yourself in awe of the view that is developing: a vast and uninterrupted vista across an unfathomable landscape as far as the eye can see. 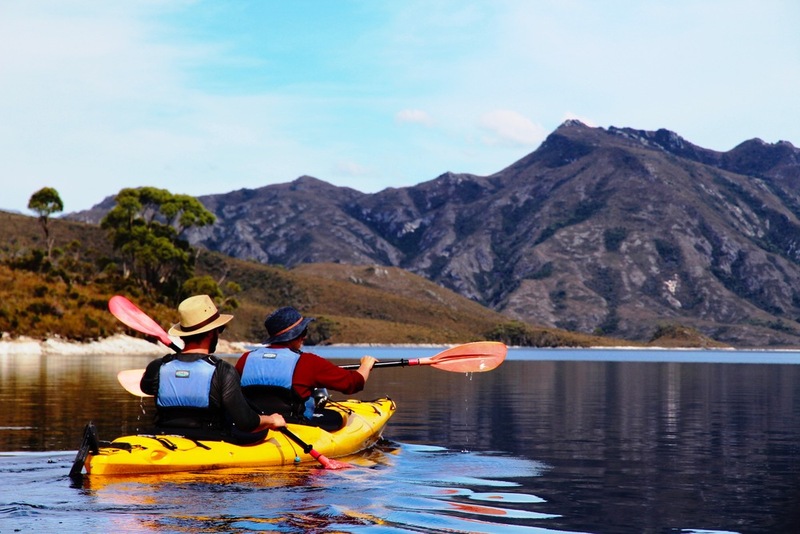 One gains an appreciation for where the original Lake Pedder lies beneath the depths of the mirror-like surface of the water that now fills the valley. Morning tea at High Camp Hut with a steaming cuppa in hand we glance upward across the dolerite scree that will lead up the staggered spine of Mt Eliza. Walking on we gain elevation rapidly, rock hopping over lichen splashed dolerite boulders that formed in vast magmatic sills when dinosaurs roamed the Earth in the Jurassic period. 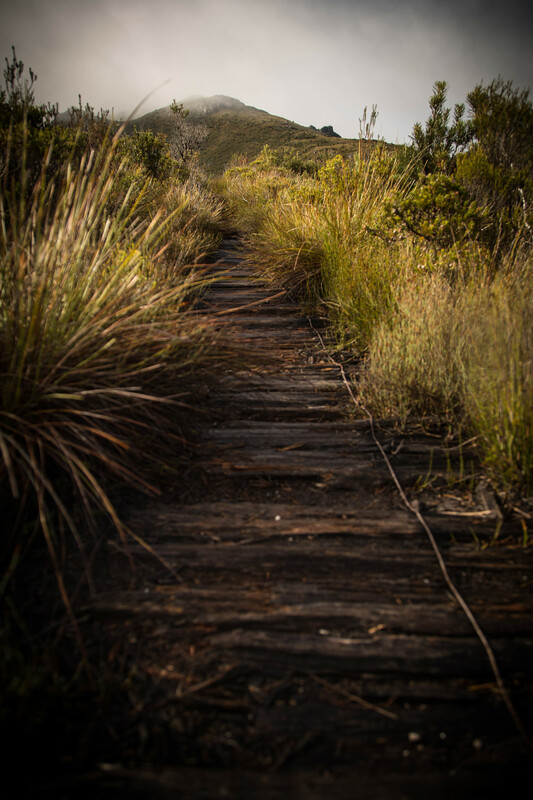 We truly feel the adventure as hand over hand we clamber up onto the mountain summit - exposed, remote, alive. 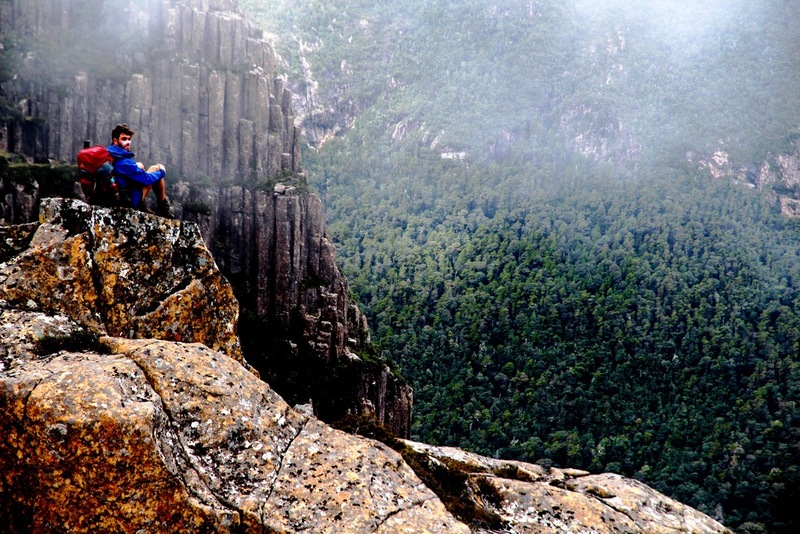 Views extend across what feels like half of Tasmania - Federation Peak jutting out of the Eastern Arthur Range like the gnarled tooth of a beast from Mordor; the Western Arthur Range trailing away as rugged and formidable as ever. 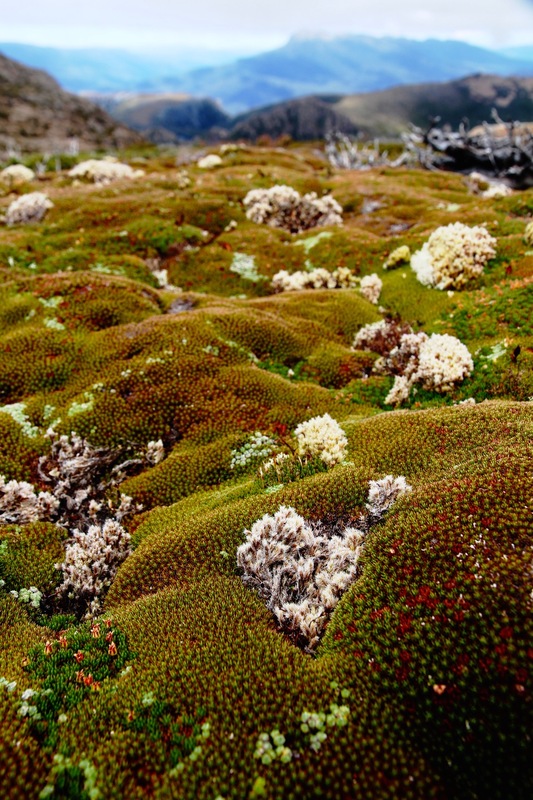 An exposed walk across to Eliza Plateau exhibits the extraordinary beauty of Tasmania's alpine wonderland - cushion plants older than civilisations protrude the landscape like miniature worlds. Ancient stunted and coppiced Pandani plants occupy naked depressions conjuring images of prehistoric landscaped gardens. We take a moment to have lunch atop Eliza bluff overlooking Lake Judd - a vestige of a once glacial filled valley gouged and formed only ten thousand years ago. Our walk back allows us the uninterrupted opportunity to watch as the peachy light plays off the surface of the watery expanse. The views continue to transform as we drop in elevation along with that of the sun, golden light now beaming through the hummocks of buttongrass as we return to the trailhead. Back at the Lodge we can settle into another night at our heart in the wilderness and rest our weary legs. To wind down our adventure we pass our last moments in the Southwest meandering into the Florentine Valley. 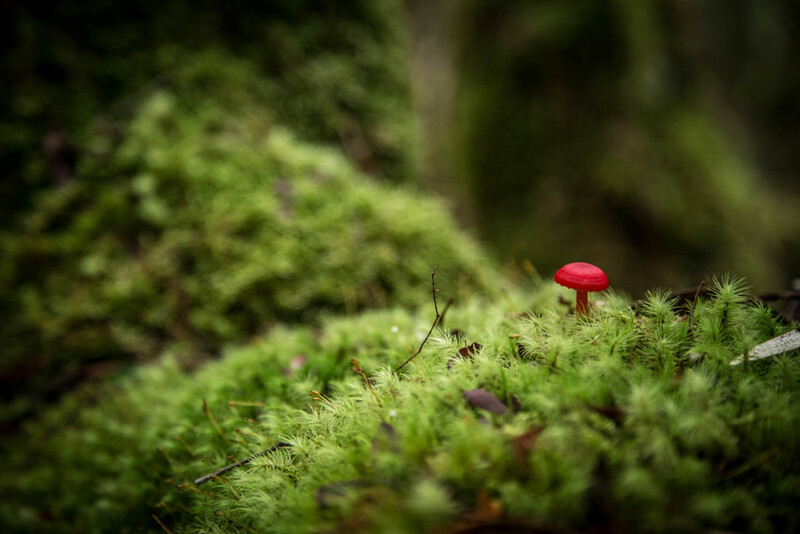 Renowned for it’s luscious wet sclerophyll and temperate rainforest, the Florentine Valley has long been a region of contention between forestry operations and environmental groups. 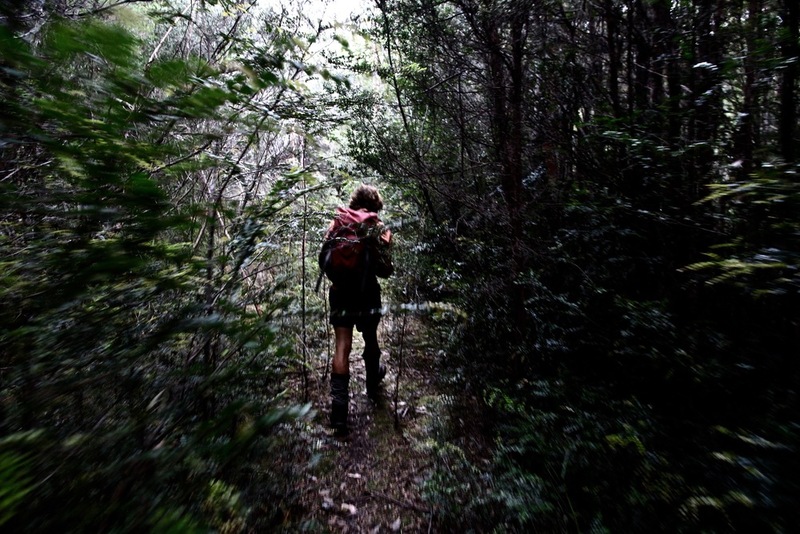 Our walk takes in both sides of this fascinating story both literally and figuratively. Stepping into another world of diversity, we have the incredible opportunity to stare up at the tallest flowering plants on our planet - the mighty Eucalyptus regnans (Tasmanian Swamp Gum or Mountain Ash). 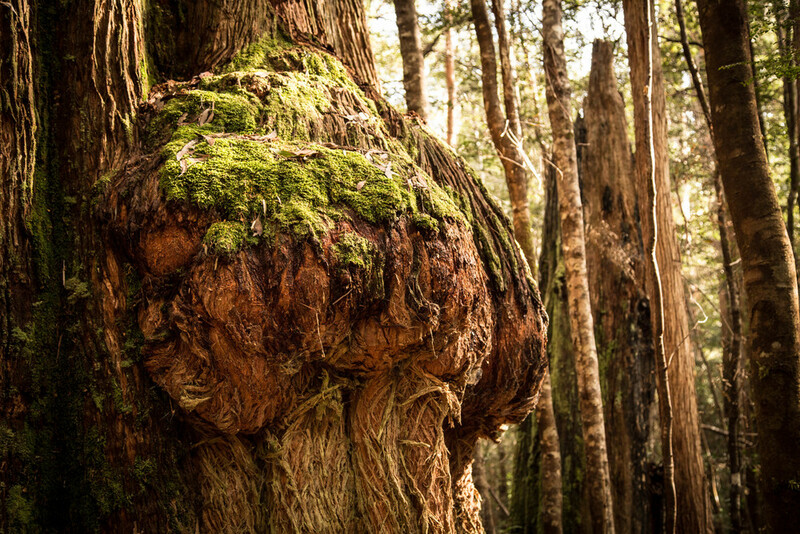 Regularly gaining heights of 85 meters tall and more, these trees are second only to the Coastal Redwoods of the U.S.A. as the tallest trees on earth. A mixture of Sassafras, Leatherwoods, ferns, mosses and lichens dominate the lower canopy as the trunks of the giant Eucalyptus protrude through the carpet of green. 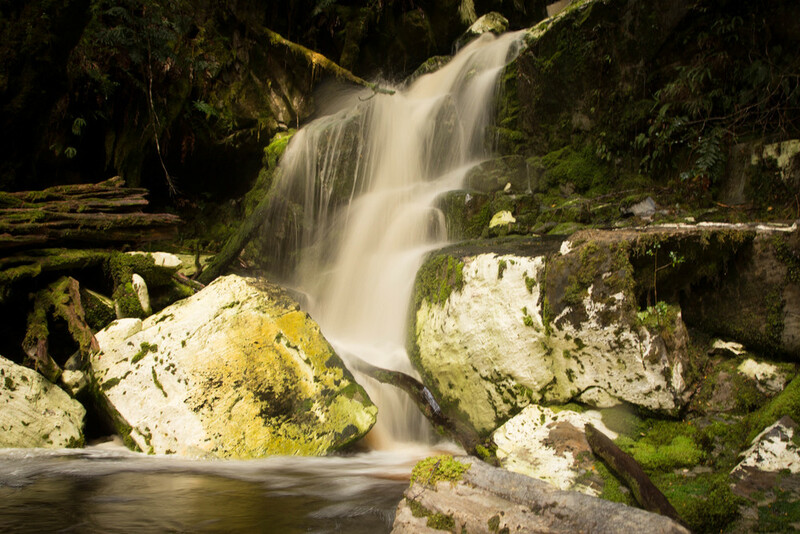 Our destination is the entrance to an ancient karst cave system, where a cascading rain forest creek falls steeply into the darkened subterranean abyss. The cave itself is part of Australia's deepest cave network, and is truly a sight to behold. Over a picnic lunch surrounded by incredible history and amazing environment, we’ll chat about stories created and memories shared on our journey. After lunch, it is a short walk to meet out vehicle followed by an hour and a half drive through undulating hills following the vast Derwent Valley before arriving at the conclusion of our adventure in old Hobart town. 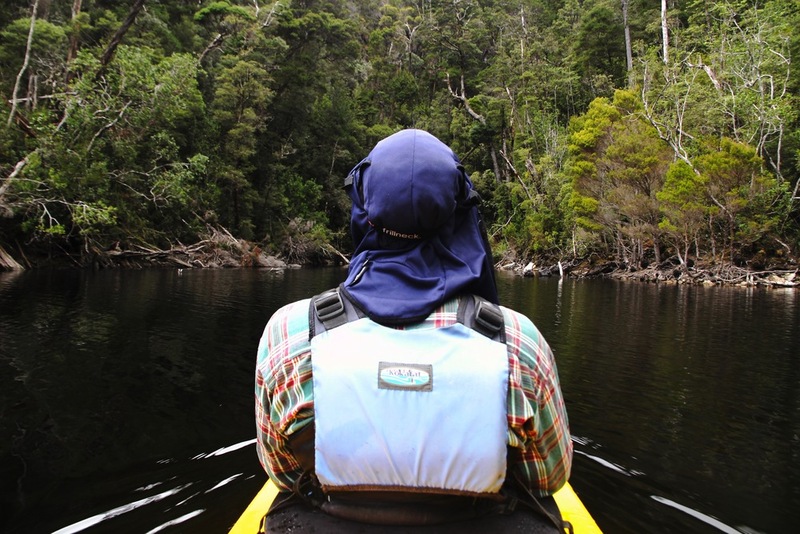 Accommodation is provided by the Pedder Wilderness Lodge in Strathgordon, within the Southwest National Park. From the outside, the lodge resembles the hydro workers housing from days past, blending into the subtle greens and browns of the encroaching vegetation. 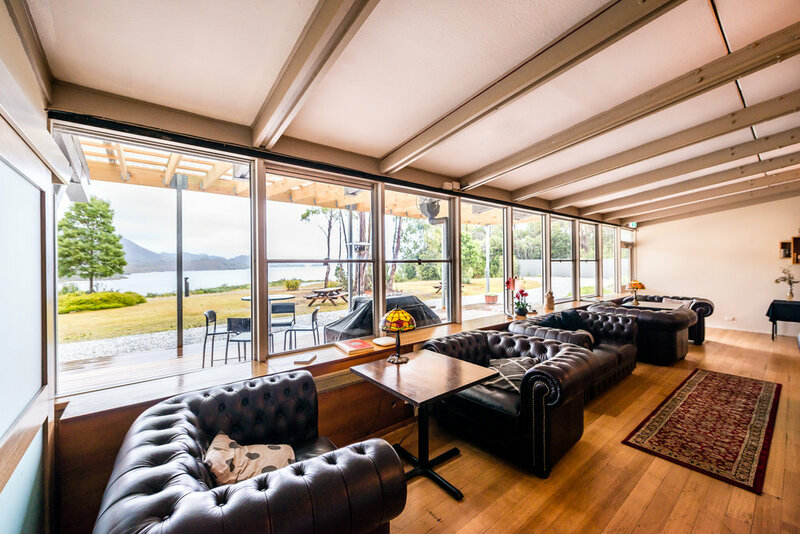 From the inside, enveloped in the warmth of the wood fire, we can sit at the newly constructed King Billy pine bar and glance out over Lake Pedder towards the jagged ranges beyond. We have a delicious breakfast and dinner menu tailored to sustain our adventurous activities (whilst tending to any guests dietary requirements). Working closely with the resident chef we have formulated a four day menu that is intended on being delicious, filling, fresh and featuring all that Tasmania is famous for. To compliment our meals we have a range of Tasmanian wines, beers, and teas and coffees for your enjoyment. The Pedder Wilderness Lodge has been operating under new management since Spring 2015, and with a change in name and numerous renovations; a comfortable refuge from the Southwest wilderness has been achieved township of Strathgordon was constructed in the 1970’s to house workers of the Hydro Electric Commission, who were employed in the construction of the infrastructure required to dam the Gordon River and to impound Lake Pedder for the Gordon River Hydro Electric Scheme. At its peak, the town had a population of some 2000 people and featured a range of amenities including shops, school, hospital and a post office. Although a public venue, we reserve the finest Pedder Wing rooms for your good nights rest, featuring the comfort of queen size beds, en-suite bathrooms and modern amenities. Do you have a different experience in mind? 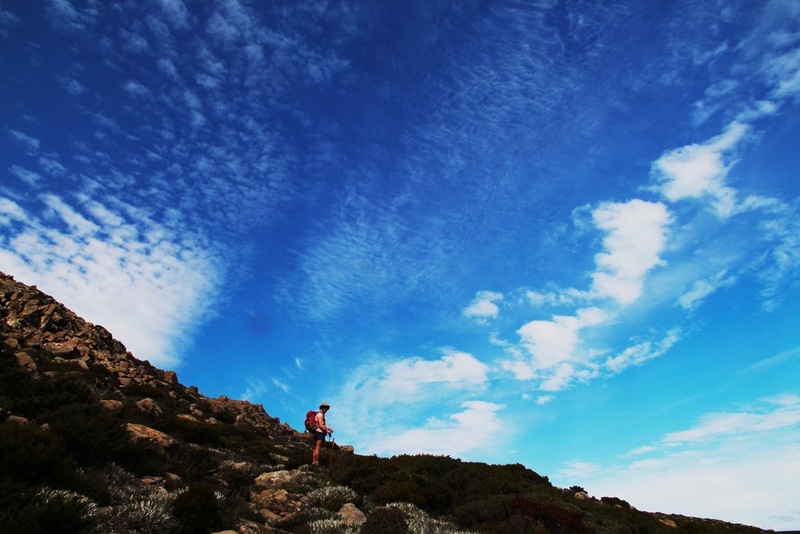 Would you like to organise an adventure that is somewhat more or less adventurous, longer or shorter in duration? 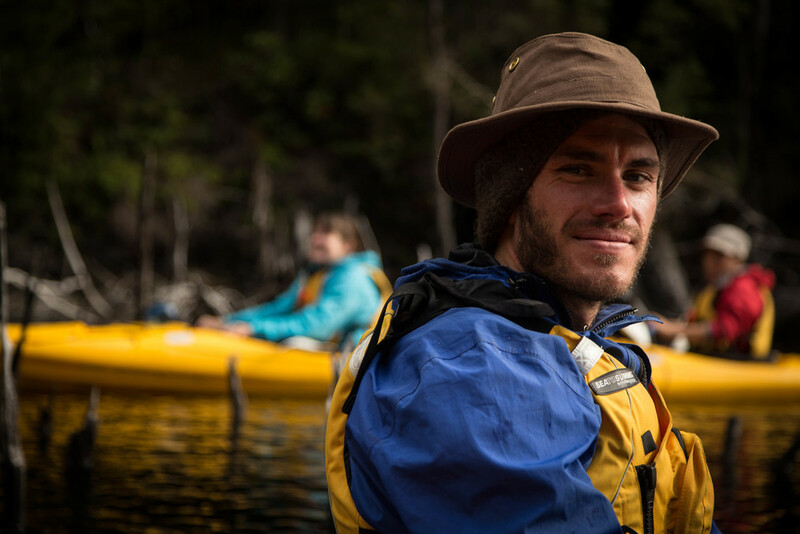 Cody & Lou are available to discuss group itineraries of any detail whether it is a team building experience or an extended wilderness experience. 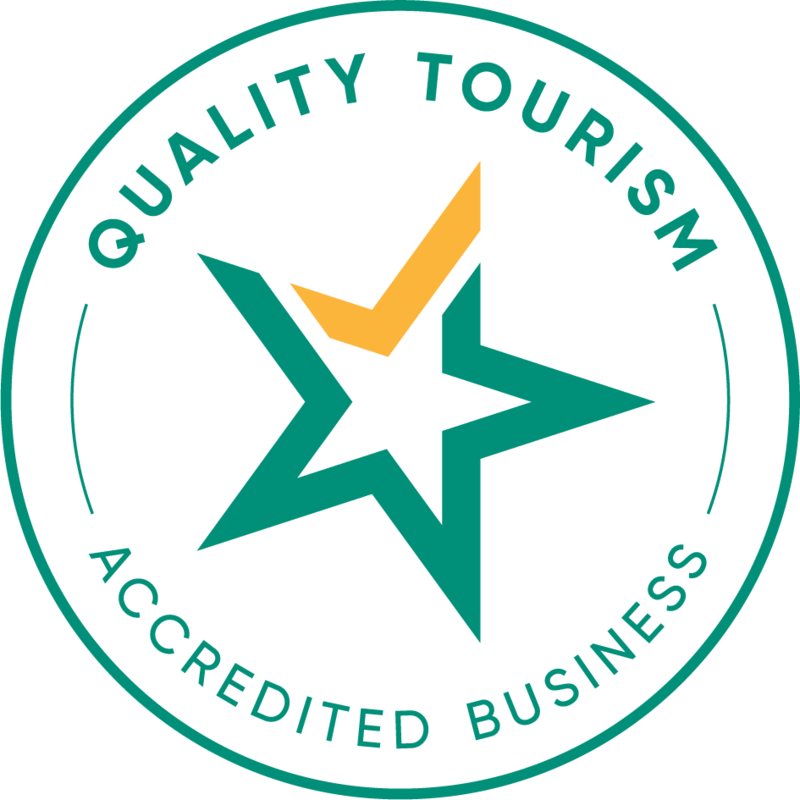 Cody & Lou are always excited by new and creative adventures, and are gladly available to have a chat and work out the tour that will suit your needs. Get in touch to discuss a Tailored Experience with Wild Pedder.